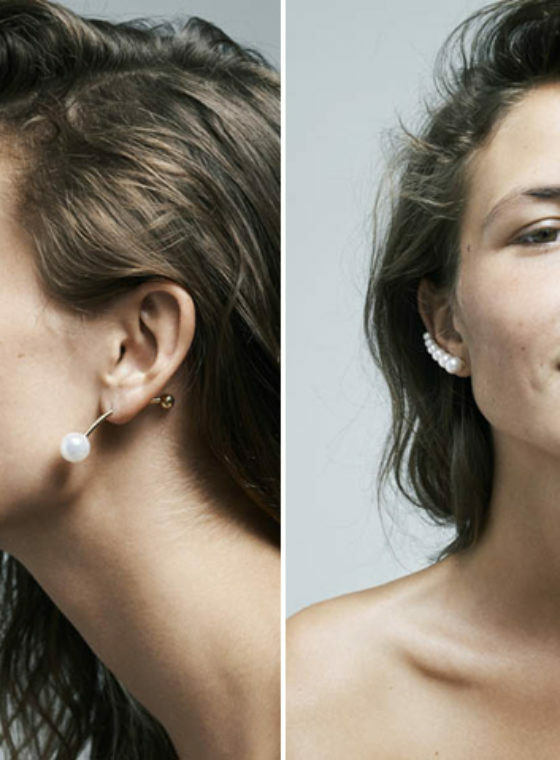 Karl Lagerfeld turned up the ol’ pearl game about 100 notches with ginormous pearl necklaces, bracelets and rings for Chanel‘s spring collection. Costumey, over-the-top and DIYable . . . I was sold. 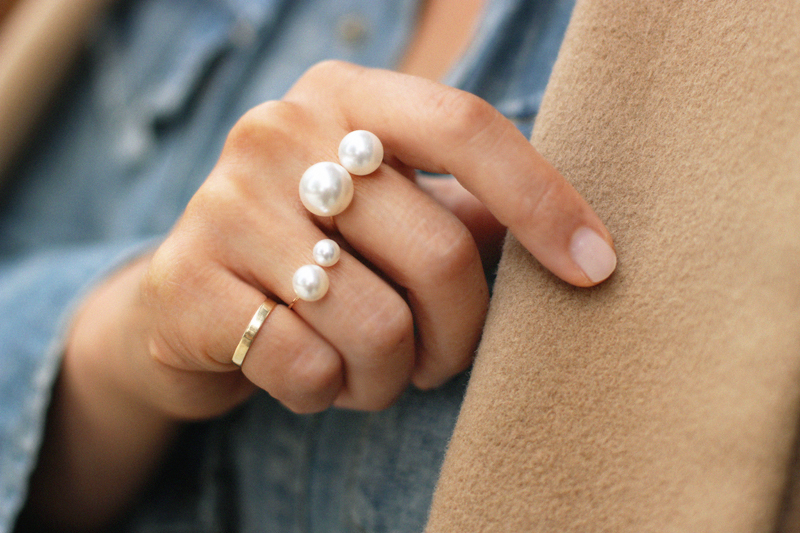 Next came the painstakingly long search for the largest pearls I could find and in my hunt for pearls, came the inspiration to make rings inspired by Russian designer Maria Stern‘s super chic double pearl rings. 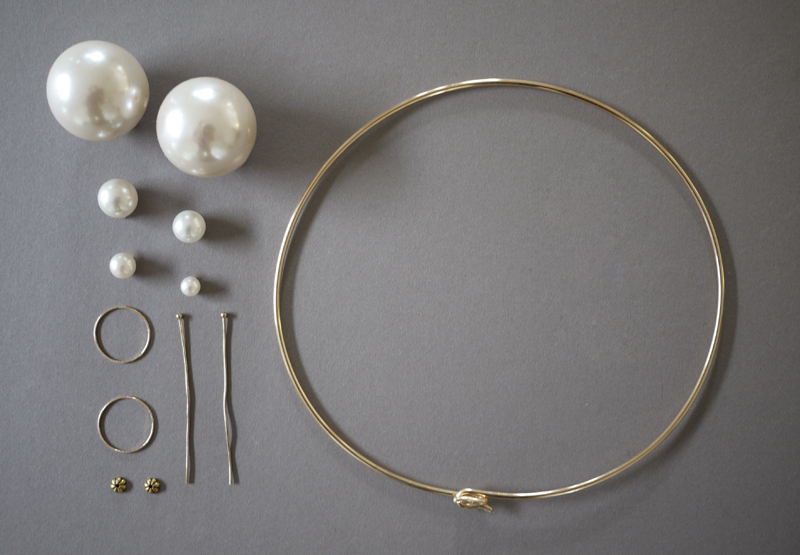 It’s a pearl party and everyone is invited! 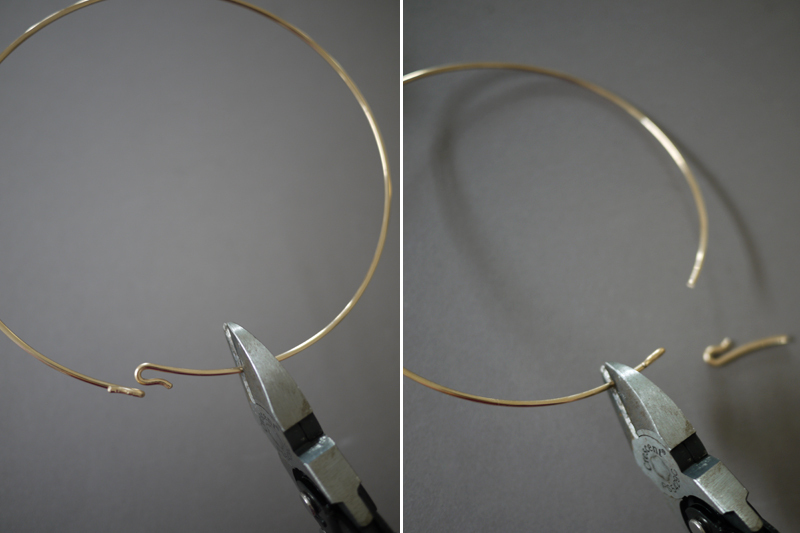 Use a pair of heavy duty wire clippers and clip off the clasp of the choker. I’m using 30mm pearl beads here since they were the largest I could find. Ideally, I would have liked to use a half drilled pearl bead but I couldn’t find that either – but was able to find a solution to cover up the other holes. After trimming the clasp off the choker, add a good amount of E6000 to the end of a toothpick and fill one side of the bead with glue. 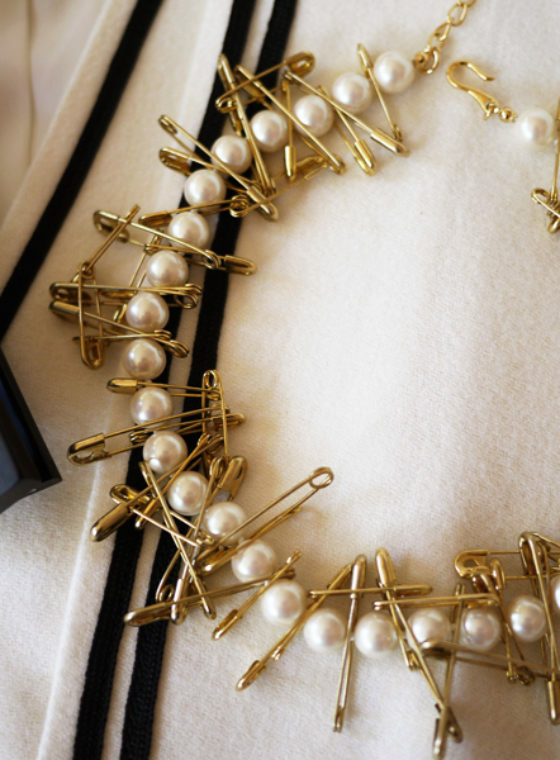 Insert the ends of the choker halfway into the bead and allow to dry completely overnight. Trim the ball end headpin and add the bead cap. 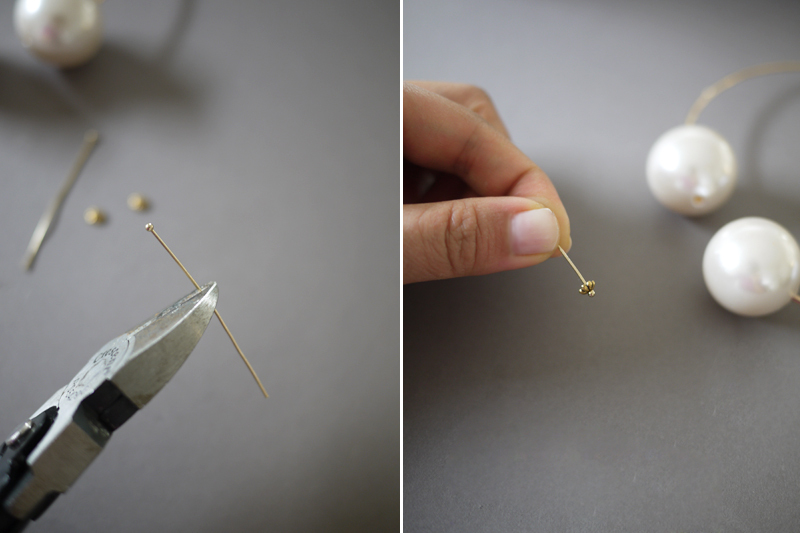 Apply a line of glue along the headpin and insert it into the other holes. Allow to dry completely. For the pearl rings, I’m used super thin rings that fit perfectly into the half drilled Swarovski pearls. Since smaller half drilled pearls are pretty easy to come by, I wanted to make them asymmetrical. 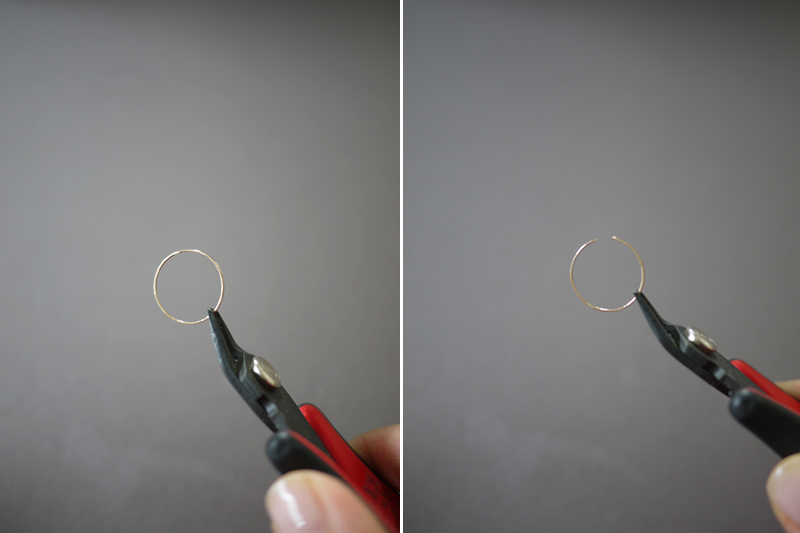 To start, cut just a small piece out of the ring. 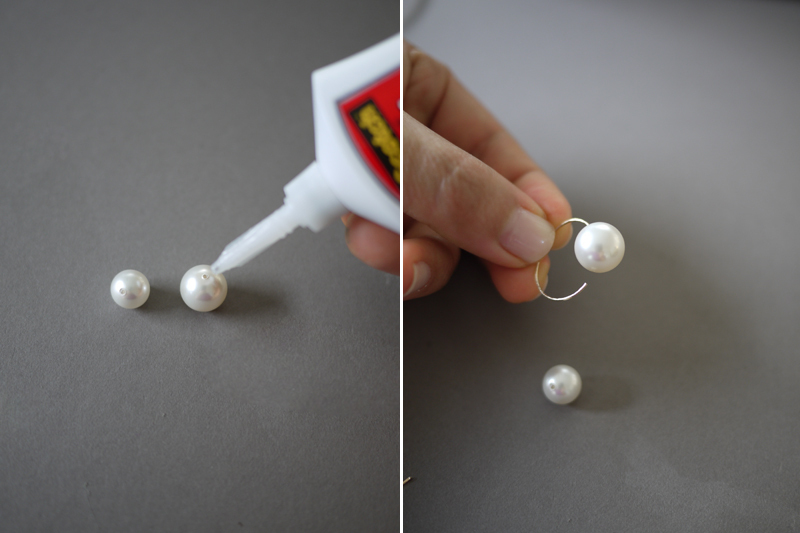 Carefully squeeze super glue into the holes of the pearls. Attach them to each opening of the ring and allow to dry completely. 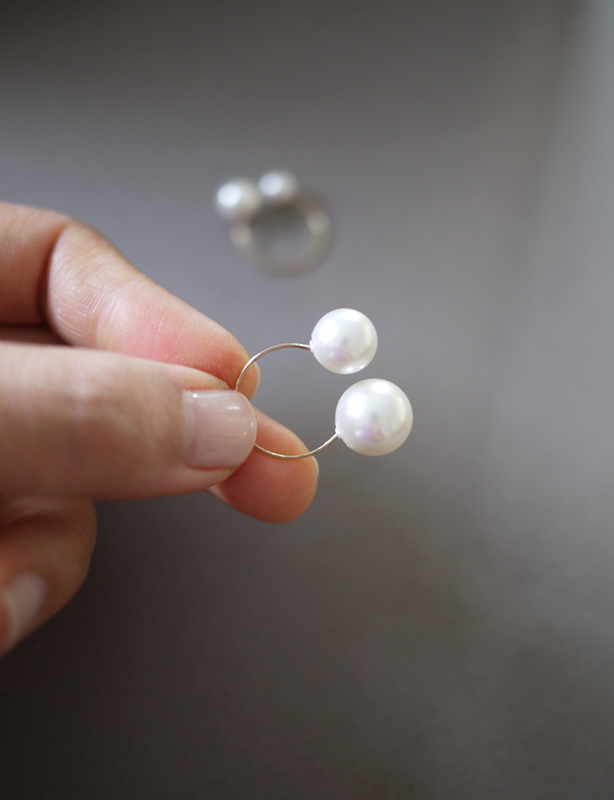 Once the ring has dried completely, you can bend the pearls up to help mold the ring to fit your finger. The rings I ordered came in a set of 5 so it was impossible to make just one! I am so doing that, love it. Really cool! I especially like the rings! You two ladies are such an inspiration. I have been thinking of expanding my Meghan and Julie shop on Etsy to make accessories for moms and jewelry for the little girl in addition to my hair candies. You are giving me that extra push. Thanks for your amazing posts. Happy I stumbled upon your blog. SO chic! I adore the rings. love those rings!! I’ll definitely be copying this idea! i love the idea.. I will try it for sure! This is so cool-I wonder what the original one costs? On the same site you linked to I saw a photo of a Lorraine Schwartz similar style but off center-you could achieve that look by cutting off more of the hoop and wearing it a bit to the side. What a cute idea !! Love!! I want a ring. I’ve been wanting to make my own accessories recently. Thanks for the inspiration, I might go on my own pearl hunt myself. Hello I love your blog and wish you showed more DIY ideas. This was really good. Thanks. Fabulous. Don’t wear gold so I’m looking for silver chokers. I showed this to my 16year old daughter and she said “While you are at it, make me some rings.” Yes ma’am, I’ll be making lots of both. The online store which I linked to in the supply list carries the choker in silver, I believe. Have fun!! Great DIY! I should totaly do it! Amazing diy!! Will definitely try it out when I find the correct tools!! Thanks for sharing!! 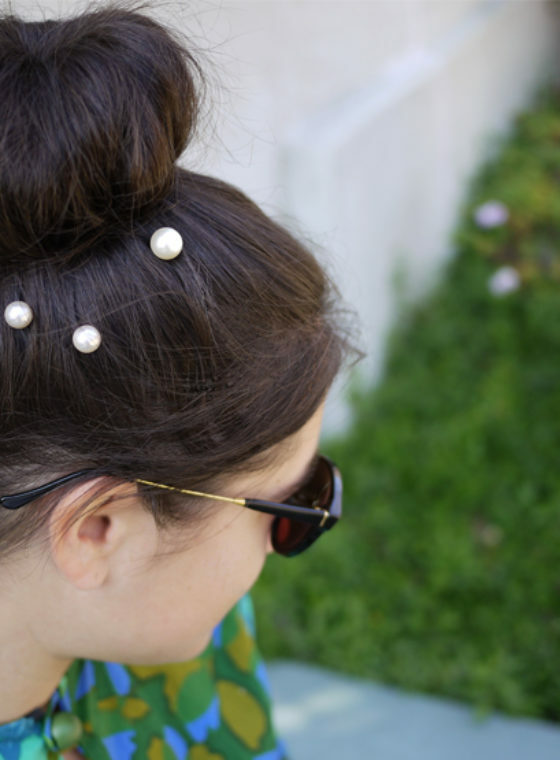 I adore pearls, and who doesn’t want to look classy and chic without breaking the bank. Thanks for the inspiration. 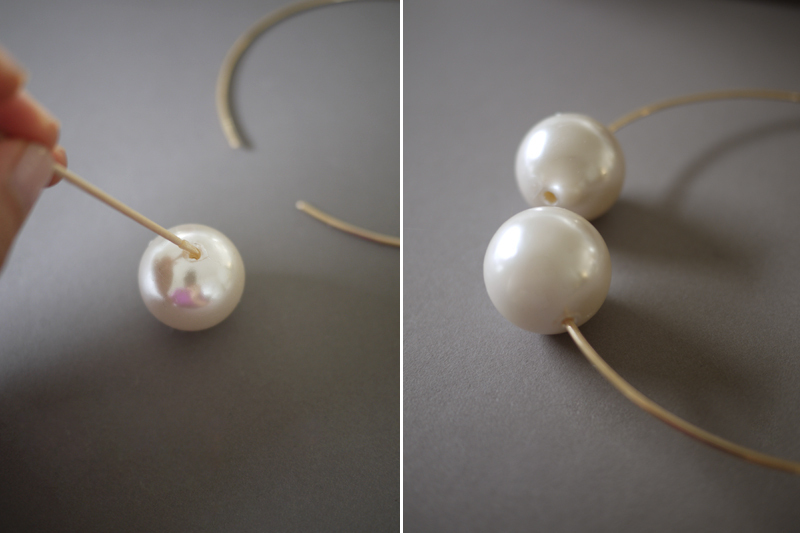 I had a couple of pearl related diy accessories done too on my blog with a similar feel. What a great way to use up memory wires! I bought all the materials you linked to and followed your instructions….I am a pretty capable crafter but I can not get the pearls to stay on the rings. I don’t know what is going on. I have tried multiple times. I clean the rings of any oil or dirt. I fill the holes with glue and put glue on the rings. I leave the rings untouched to let the E6000 dry and cure for 24+ hours. I have only gotten one pearl to remain glued to the ring. HELP! Are the rings you linked to different than the rings you used? Can you recommend a different source? I appreciate any tips. Thanks for sharing this. I want a ring that looks like this and was perusing the internet for one at a price I can afford when I happened upon this DIY tutorial! It’s really nice & chic! Love it! 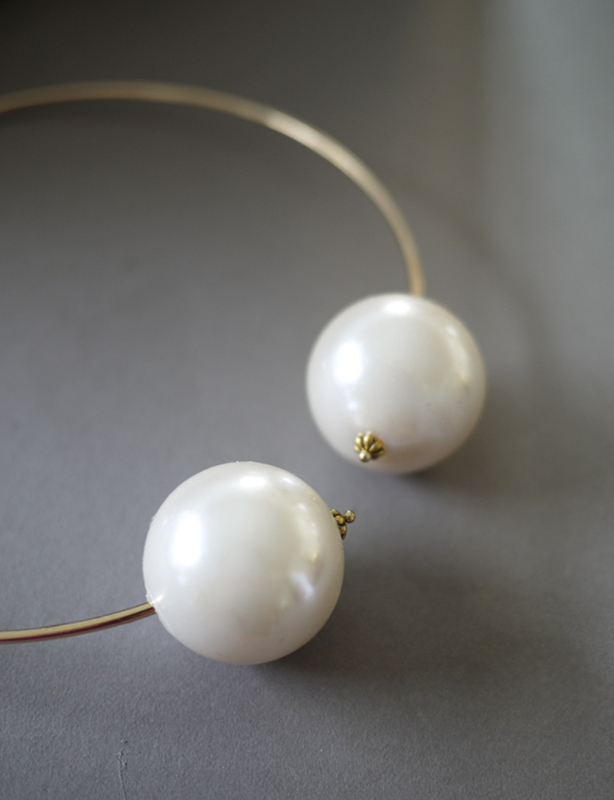 I like this pearl choker and rings. Wonderful ideas of DIY. I am going to try this. I was just at the craft store and saw these enormous pearl beads on clearance and thought wtf would I make with those??!! Well, I just might have to return to buy them because Honestly WTF gave me the answer. Thank you!! It’s looking unique idea , i will try this in my home. South sea pearl may be natural pearl. Natural pearl did not farm I heaard that. Great details about Pendant Necklace. leisure account it. Glance complicated to more added agreeable from you!